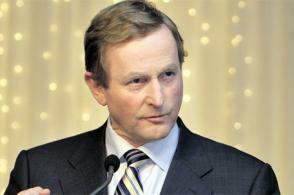 Enda Kenny, of Fine Gael, formed a coalition government with the Irish Labour Party, after a landslide victory in February against the Fianna Fáil-Green Party coalition. The Labour Party had managed to achieve an historic second place in the election, the first in the Republic’s history where the second party had not been either Fianna Fáil or Fine Gael, while the other was in government. Fianna Fáil had been pushed into third place losing 51 seats and winning only 20 which was close to the 14 seats won by Sinn Fein, while the Green Party lost all seats they had held (6). The main reason for the lack of faith with Fianna Fáil and the Green Party was the dire economic situation that the Irish Republic faces even today whereby its governmental debt was 94.2% of its GDP. The previous government had, like many other countries, bought into their banks using tax payer money in an attempt to avoid total collapse of the Bank of Ireland. The other reason for lack of faith was due to the fact that the Fianna Fáil led coalition had not saved any money during the Celtic tiger boom years of the early millennium. Thus leaving the country to face dramatic austerity measures, while stalling to accept an economic bailout by the other members of the EU (including £7 billion from the UK). Enda Kenny as Taoiseach has stated that he aims to renegotiate the interest rates applied to their bailout, where as noticeably seen many members in the EU are reluctant to do so. Thus this is one area in where it can prove to be one of the defining points of this government, in what is the Irish Republic’s darkest hour. It will also be interesting to watch how this government will support small and medium sized businesses and how it deals with the diabolical unemployment level. Cuts must still take place but it is where the new government prioritises its cuts that will show whether they can be the government of leadership rather than the failure like that of the one before it. The Irish people have already seen their fair share of cuts and many are ensuring their anger is heard by attending protests directed at the Fianna Fáil coalition. The main complaint being the ever rising price of food and living costs, yet cutting down the limit of the minimum wage. To be successful the Irish Republic under this new government’s leadership needs to continue appealing to American businesses to settle in the Shannon region (West Ireland), while continuing to promote itself to the world as a place where people should consider taking breaks/holidays; tourism being one of the main industries on the island. Enda Kenny also will need to ensure that the population don’t suffer more than their fair share of the cuts and to provide support to those who are suffering the worst. The renegotiating bailout interest costs, if successful, will also aid Ireland in its attempt to stabilise itself. As Enda Kenny stated on the annual Taoiseach trip to the White House (St Patrick’s Day) “Ireland remains and continues to remain open”. Only time will tell as to whether the new Fine Gael–Labour Party coalition under the leadership of Enda Kenny can prove to be successful or be a failure like its predecessor.